We are in the midst of a revival of an ancient way of looking at the world--an approach that enabled great civilizations of the past to bring forth inventions of great beauty and power. This school of thought--harmonics--envisioned the natural world and the solar system as an interlocking matrix of harmonious numbers, perfectly woven into the creative fabric of life and the surrounding universe. Exploring the art and science of harmonics, John Oscar Lieben shows how to create harmonious forms using the ancient tools of number, geometry, and musical tone--an approach that resonates with nature’s own ways of creation. He demonstrates many practical applications that result from the study of harmonics, providing analyses of ancient sculpture and architecture, as well as original examples of building floor plans, pottery figures based on planetary proportions, gardens based on harmonic principles, and ceremonial spaces that honor cosmic harmonies and sacred geometric relationships. Showing how harmonics can also be applied to the mysteries of time and space, the author demonstrates how the vesica piscis and many other variations of the vesica shape reveal numerical synchronicities and correspondences that connect cosmic time cycles, measures of space, and musical tones. The author applies harmonics and the “vesica construction” matrix to illustrate many of nature’s wonders, including the Earth-Moon relationship, the interactions of the Golden Number and the musical scale, and how the Flower of Life symbol connects the universal field with the pattern of raindrops falling on a pond. Offering an approach to sacred geometry that pairs the mystical with the practical, the cosmic with the earthly, the author reveals how the art and science of harmonics should be required study for both the artist and the seeker of eternal truths as well as the scientist who seeks an entrance into the sacred foundations of nature. When we begin to see in this way it becomes clear that the concept of a meaningless Universe in which evolution proceeds blindly from random event to random event is a delusion. This new way of seeing is really very old. It has been called harmonics, which includes the disciplines of number, geometry, music, and cosmology--the Quadrivium of the ancient mystery schools. Of great importance to the ancients was the discovery of the numerical ratios, which were the basis of musical intervals. While musicians had intuitively employed these ratios since the beginnings of their art, the practitioners of the harmonic arts realized that such intervals could also be obtained through the integral divisions of the musical string. This discovery of a numerical basis for sensory experience was the beginning of exact science. This science of sound as embodied in the musical scales became the foundation of a musical-numerical conception of nature, which included ideas as diverse as astronomical cycles and the nature of the human soul. The art of geometry was part of this exploration since it could visually portray numbers just as music could portray them through sound. In the process of their geometric work it became apparent to the harmonicists that the generated forms had symbolic qualities--that is, they could somehow awaken perceptions about higher realities. For example, the circle seemed to have an affinity with universal cycles and with the infinite; the square with the earthly and the finite. Thus the circle-in-the-square could represent the human being who was seen as an earthly vessel containing a divine essence. This symbolic character of geometry provides a simple way of contemplating complex ideas and processes and as such it became an indispensable foundation in the training of both artists and philosophers in the ancient world. Today, as in the past, when space designers working with sacred intention wish to place a firm foundation under their work they must turn to the laws of creation, which include the laws that determine cosmic time cycles and the shapes that arise from natural forces. While these laws can be complex there are simple ways of making use of them, and this is what harmonics offers. The study of harmonics is an entry into a world of cosmic meaning. This ancient art is now rising from the dark sea of the unconscious like a lost continent where once a great, golden civilization flourished. As we unearth the artifacts we wonder why they should appear now. Is there a reason? Isn’t everything random and meaningless as so many of us have been taught? The harmonicist knows that this is untrue and the reason the mountains are rising from the dark sea is that--it is time. The wheel has turned, the flower is opening, and the Law must be fulfilled. Specifically this book demonstrates ways of creating harmonious forms using geometry and numbers derived from the musical scale. In this approach we are working with tools that are as ancient as time yet perfectly suited to be impeccable instruments for the creation of new forms. The reader will find that the discipline of harmonics naturally weaves together symbolic form (geometric, numerical, and musical) and the practical. The practical applications, the human creations, will be seen to arise naturally from the energy contained within primordial number and geometry. This process resonates with nature’s way of creation in which complex forms arise from the simple geometric shapes of atomic structures. I have found that there is a creative matrix in which these energies can interact. I have called this the vesica construction. Its central figure is the vesica, the leaf-shaped product of the intersection of two circles. This is a highly charged symbolic figure, which can take infinite forms ranging from a thin sliver, when its intersecting circles are barely penetrating one another, to wider and wider figures resembling fish and eyes and then to broad figures shaped like fruit until it becomes a circle as the intersecting circles join and become congruent. While this figure may seem simplistic, it actually has profound symbolic and generative properties. The process of intersection of the vesica-forming circles exactly corresponds to the intersections of waves perhaps the most universal of dynamic processes in nature. The infinite variety of vesica shapes corresponds to the innumerable height-to-width size ratios of created beings. And the vesica ratios, which we will use, are of great interest in their intimate association with tonal ratios. This will be discussed further in chapter one as well as the establishment of the vesical construction matrix. We should note that almost all the constructions demonstrated in the book can be made using classical geometry: geometry created using only compass and straight edge--that is, without the need for measurement. While this simplifies the drawing process there are deeper reasons for this restriction. It requires one to proceed one step at a time, building each new part on a previous part. This is the way of nature: from seed to sprout to leaf to flower. The sequence must be followed. One cannot hurry through and in this there is room for quiet contemplation which invites the unknown, the new, to enter. 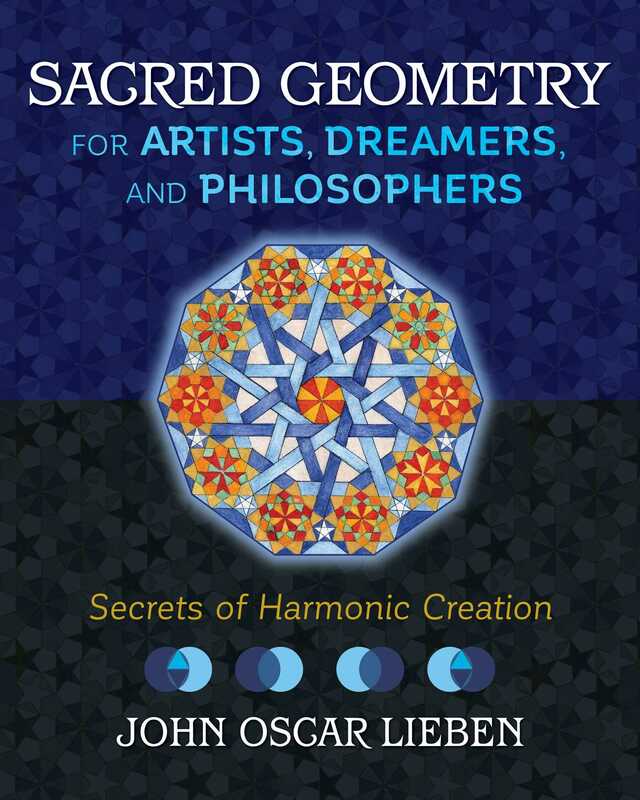 John Oscar Lieben is a geometer who has researched sacred geometry and harmonics for over 25 years. A graduate of New York University, he also studied at Oregon School of Arts and Crafts and Roehampton College in London. A designer and builder of gardens and ceremonial spaces proportioned by sacred geometry, he lives in Bellingham, Washington.